Comedian Bill Maher tweeted a recreation of an infamous photo of former Democratic Sen. Al Franken groping a woman while on a return flight home from a USO tour in 2006. 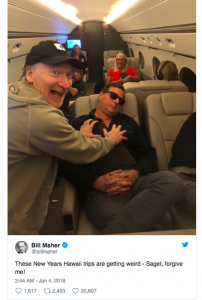 In the photo, Maher is seen smiling a the camera with his hands placed on the chest of a sleeping Bob Saget. “These New Years Hawaii trips are getting weird – Saget, forgive me!” the photo is captioned.